For other people with the same name, see Jimmy Webb (American football) and Jimmy Webb (climber). Jimmy Layne Webb (born August 15, 1946) is an American songwriter, composer, and singer. He has written numerous platinum-selling songs, including "Up, Up and Away", "By the Time I Get to Phoenix", "Wichita Lineman", "Galveston", "The Worst That Could Happen", "All I Know", and "MacArthur Park". He has had successful collaborations with Glen Campbell, Michael Feinstein, Linda Ronstadt, The 5th Dimension, Art Garfunkel, and Richard Harris. Webb was inducted into the Songwriters Hall of Fame in 1986 and the Nashville Songwriters Hall of Fame in 1990. He received the National Academy of Songwriters Lifetime Achievement Award in 1993, the Songwriters Hall of Fame Johnny Mercer Award in 2003, the ASCAP "Voice of Music" Award in 2006, and the Ivor Novello Special International Award in 2012. According to BMI, his song "By the Time I Get to Phoenix" was the third most performed song in the fifty years between 1940 and 1990. Webb is the only artist ever to have received Grammy Awards for music, lyrics, and orchestration. Webb was born on August 15, 1946 in Elk City, Oklahoma. His father, Robert Lee Webb, was a Baptist minister and alumnus of the United States Marine Corps who presided over rural churches in southwestern Oklahoma and west Texas. With his mother's encouragement, Webb learned piano and organ, and by the age of 12 was playing in the choir of his father's churches, accompanied by his father on guitar and his mother on accordion. Webb grew up in a conservative religious home where his father restricted radio listening to country music and white gospel music. During the late 1950s, Webb began applying his creativity to the music he was playing at his father's church, frequently improvising and rearranging the hymns. He began to write religious songs at this time, but his musical direction was soon influenced by the new music being played on the radio, including the music of Elvis Presley. In 1961, at the age of 14, he bought his first record, "Turn Around, Look at Me" by Glen Campbell. Webb was drawn to the singer's distinctive voice. Jimmy Webb was raised in Laverne, Oklahoma according to the Oklahoma Hall of Fame. In 1964, Webb and his family moved to Southern California, where he attended San Bernardino Valley College studying music. Following the death of his mother in 1965, his father made plans to return to Oklahoma. Webb decided to stay in California to continue his music studies and to pursue a career as a songwriter in Los Angeles. Webb would later recall his father warning him about his musical aspirations, saying, "This songwriting thing is going to break your heart." Seeing that his son was determined, however, he gave him $40, saying, "It's not much, but it's all I have." After transcribing other people's music for a small music publisher in Hollywood, Webb was signed to a songwriting contract with Jobete Music, the publishing arm of Motown Records. The first commercial recording of a Jimmy Webb song was "My Christmas Tree" by The Supremes, which appeared on their 1965 Merry Christmas album. The following year, Webb met singer and producer Johnny Rivers, who signed him to a publishing deal and recorded his song "By the Time I Get to Phoenix" on his 1966 album Changes. In 1967, Rivers released Rewind, an album featuring seven Jimmy Webb songs, including "Do What You Gotta Do" and "Tunesmith", a song also recorded that year by Vikki Carr for her album It Must Be Him. That same year, Rivers turned to Webb for material for a new group Rivers was producing called the 5th Dimension. Webb contributed five songs to their debut album, Up, Up and Away, including the title track "Up, Up and Away", which was released as a single in May 1967 and reached the Top Ten. The group's follow-up album, The Magic Garden, was also released in 1967 and featured eleven additional Webb songs, including "The Worst That Could Happen". In November 1967, Glen Campbell released his version of "By the Time I Get to Phoenix", which reached number 26 and became an instant pop standard. At the 1968 Grammy Awards, held in February 1968, "Up, Up and Away" was named Record of the Year (1967) and Song of the Year (1967). "Up, Up and Away" and "By the Time I Get to Phoenix" received eight Grammy Awards between them. Webb's success as a new songwriter underscored what became the central dilemma in his career. While his sophisticated melodies and orchestrations were embraced by mainstream audiences, his peers were embracing counterculture sounds. Webb was quickly becoming out of sync with his times. In 1968, Time acknowledged Webb's range, proficiency, and "gift for strong, varied rhythms, inventive structures, and rich, sometimes surprising harmonies". That year, the string of successful Webb songs continued with the 5th Dimension's "Paper Cup" and "Carpet Man" reaching the Top 40, Glen Campbell's "Wichita Lineman" selling over a million copies, and Johnny Maestro & the Brooklyn Bridge scoring a gold record with "The Worst That Could Happen", a song originally recorded by the 5th Dimension. Webb formed his own production and publishing company that year, Canopy, and scored a hit with its first project, an unlikely album with Irish actor Richard Harris singing an album of all Webb songs. One of the songs, "MacArthur Park", was a long, complex piece with multiple movements that was originally rejected by the group The Association. Despite the song's seven minute, twenty-one second length, Harris's version reached #2 on the Hot 100 on 22 June 1968. The album A Tramp Shining stayed on the charts for almost a year. Webb and Harris produced a follow-up album, The Yard Went On Forever, which was also successful. At the 1969 Grammy Awards, Webb accepted awards for "By the Time I Get to Phoenix", "Wichita Lineman", and "MacArthur Park". In 1969, Glen Campbell continued the streak of Webb hits with the gold record "Galveston" and "Where's the Playground Susie". Webb and Campbell had first met during the production of a General Motors commercial. Webb arrived at the recording session with his Beatle-length hair and approached the conservative singer, who looked up from his guitar and said, "Get a haircut." That same year, two Webb songs became hits for the second time with Isaac Hayes' soulful version of "By the Time I Get to Phoenix" and Waylon Jennings' Grammy-winning country version of "MacArthur Park". Webb finished up the year by writing, arranging, and producing Thelma Houston's first album, Sunshower. As the decade came to a close, so too did Webb's string of hit singles. He began to withdraw from the formulaic process in which he worked and began to experiment with his music. He started work on a semi-autobiographical Broadway musical called His Own Dark City, which reflected the emotional displacement he felt at the time. He also wrote music for the films How Sweet It Is! and Tell Them Willie Boy Is Here. Webb's career as a singer-songwriter got off to a rough start with the "counterfeit" album Jim Webb Sings Jim Webb, released by Epic Records in 1968. According to Webb, the album was produced "by a bunch of ruffians from some old demos of mine and tarted up to sound like 'MacArthur Park'". Beginning in 1970, Webb released six original albums of his own songs: Words and Music (1970), And So: On (1971), Letters (1972), Land's End (1974), El Mirage (1977), and Angel Heart (1982). Despite the critical reception that followed each of these projects, Webb has never been as successful as a performer as he has been as a songwriter and arranger. Each album was noted for its inventive music and memorable lyrics. Webb's debut album as a performer, Words and Music, was released on Reprise Records in late 1970 to critical acclaim. Rolling Stone writer Jon Landau called one of the album's cuts, "P.F. Sloan", a "masterpiece [that] could not be improved upon". The album also features the ambitious song trilogy "Music for an Unmade Movie". Webb's 1971 follow up album, And So: On, proved equally appealing to critics. Rolling Stone declared the album "another impressive step in the conspiracy to recover his identity from the housewives of America and rightfully install him at the forefront of contemporary composers/performers." The album features the songs "Met Her on a Plane", "All My Love's Laughter", and "Marionette". Also in 1971, the Three Degrees are featured in the movie The French Connection giving a rendition of Webb's song "Everybody Gets To Go To The Moon", originally recorded in 1969 by Thelma Houston. Webb's 1972 album Letters, which features his own rendition of "Galveston", met with similar praise. Music critic Bruce Eder called Letters the "most surprising, diverse, and possibly the most satisfying of all of Jimmy Webb's early solo LPs" and "arguably the best of Webb's solo albums". In his review of the album, Peter Reilly of Stereo Review wrote, "Jimmy Webb is the most important pop music figure to emerge since Bob Dylan." The album also features the songs "Campo de Encino", an homage to his park-like residence in Encino, California during the 1970s, "When Can Brown Begin", and "Piano". In 1974, Webb released Land's End on Asylum Records. Unlike his previous albums, which tended to be underproduced, Webb was able to achieve a more heavily produced pop/rock sound on Land's End, which was recorded in England with the help of an all-star session band that included Joni Mitchell, Ringo Starr, and Nigel Olsson. The album contains "a thematic consistency in that most of its songs were tales of romantic discord". While Webb continued to improve as a singer, he "still hadn't found an identity as a solo artist". The album features the songs "Ocean in His Eyes", "Just This One Time", and "Crying in My Sleep". In 1977, Webb released El Mirage on Atlantic Records. Produced, arranged, and conducted by The Beatles' former producer, George Martin, the album was Webb's "most polished effort yet as a performer". William Ruhlmann observed, "These were lush tracks full of tasty playing and warm string charts on which Webb's thin tenor was buoyed by numerous background vocalists, the whole an excellent example of the style known as 'West Coast pop'." The album contains several strong compositions, including "The Highwayman", which would later become a number one country hit for Waylon Jennings, Willie Nelson, Johnny Cash, and Kris Kristofferson, who named their super group The Highwaymen after the song. Their version of "The Highwayman" won a Grammy Award for Best Country Song. El Mirage also features the songs "If You See Me Getting Smaller I'm Leaving", a newly arranged version of "P.F. Sloan", and "The Moon is a Harsh Mistress", which had already been recorded by Joe Cocker, Glen Campbell, and Judy Collins. Despite the positive critical response to the album, El Mirage did not succeed in redefining Webb as a performer as he had hoped. Webb's final solo album from this period, Angel Heart, was released in 1982 on Lorimar Records. Like its predecessor, the album drew upon the talents of top Los Angeles session musicians to produce a classic West Coast pop sound, enhanced by guest vocal harmonies by Gerry Beckley, Michael McDonald, Graham Nash, Kenny Loggins, Daryl Hall, and Stephen Bishop. Unlike his previous solo albums, however, Angel Heart lacked the quality material usually associated with the composer. Apart from "Scissors Cut" and "In Cars", which were previously recorded by Art Garfunkel, the album offered few high points, despite its polished production. A decade would pass before Webb released his next solo album. Throughout the 1970s and into the 1980s, Webb's songs continued to be recorded by some of the industry's most successful artists. In 1972, Jimmy Webb produced The Supremes' last album featuring Jean Terrell as lead singer, The Supremes Produced and Arranged by Jimmy Webb. Webb is quoted as saying he had a crush on Mary Wilson when he wrote and produced "I Keep It Hid" featuring her on lead vocals. In 1977, the initial release of Art Garfunkel's Watermark album consisted exclusively of songs by Webb. In 1978, Donna Summer's disco version of "MacArthur Park" became a multi-million selling vinyl single that was number one on the American pop music charts for three weeks. In 1980, Thelma Houston recorded "Before There Could Be Me", "Breakwater Cat", "Gone", "Long Lasting Love", and "What Was that Song" on her album Breakwater Cat. Leah Kunkel recorded "Never Gonna Lose My Dream of Love Again" and "Let's Begin" for her album I Run with Trouble. The latter was performed live in 1980 by the born-again Bob Dylan. Tanya Tucker recorded "Tennessee Woman" on her album Dreamlovers. In 1981, Art Garfunkel recorded "Scissors Cut", "In Cars", and "That's All I've Got to Say" for his album Scissors Cut, and Arlo Guthrie recorded "Oklahoma Nights" on his album Power of Love. In 1982, Linda Ronstadt recorded "The Moon Is a Harsh Mistress" and "Easy for You to Say" on her album Get Closer. That same year, Joe Cocker recorded "Just Like Always" on his album Sheffield Steel, and The Everly Brothers recorded "She Never Smiles Anymore" on their album Living Legends. From 1982 to 1992, Webb turned his focus from solo performing to large-scale projects, such as film scores, Broadway musicals, and classical music. In 1982, he produced the soundtrack for the film The Last Unicorn, an animated children's tale, with the musical group America performing five new Jimmy Webb songs: "The Last Unicorn", "Man's Road", "In the Sea", "Now That I'm a Woman", and "That's All I've Got to Say". The rest of the album contains instrumental music composed, arranged, and conducted by Webb. That same year, he composed the soundtrack to all episodes of the TV series Seven Brides for Seven Brothers. The theme music for the 1984-85 TV sitcom E/R was written by Webb. Then in 1985, Glen Campbell recorded Webb's "Cowboy Hall of Fame" and "Shattered" for the album It's Just a Matter of Time. And heavyweights Johnny Cash, Waylon Jennings, Willie Nelson, and Kris Kristofferson recorded "Highwayman" on the album Highwayman. In 1988, Toto recorded "Home of the Brave" on the album The Seventh One. Kenny Rankin recorded "She Moves, Eyes Follow" for the album Hiding in Myself. And in 1989, Linda Ronstadt recorded the album Cry Like a Rainstorm, Howl Like the Wind, which featured four Jimmy Webb songs: "Still Within the Sound of My Voice" (with Webb playing piano), "Adios" (with orchestral arrangement by Webb), "I Keep It Hid" (with Webb playing piano), and "Shattered". In 1990, John Denver recorded "Postcard from Paris" on the album The Flower That Shattered the Stone. In 1991, Kenny Rogers recorded "They Just Don't Make Em Like You Anymore" on the album Back Home Again. In 1986, Webb produced a cantata, The Animals' Christmas, with Art Garfunkel, Amy Grant, and the London Symphony Orchestra. The cantata tells the Christmas story from the perspective of animals. In 1987, Webb produced the soundtrack for the film The Hanoi Hilton. That same year, he reunited with Campbell for the album Still Within the Sound of My Voice, for which he wrote the title song. They followed this up in 1988 with an album composed almost entirely of Jimmy Webb songs, Light Years. The album included the title song, as well as "Lightning in a Bottle", "If These Walls Could Speak" (which was recorded by Amy Grant that year) and "Our Movie". Two songs from 1982's Seven Brides for Seven Brothers also appear on the album. The record also included the songs "Other People's Lives", "Wasn't There A Moment", "I Don't Know How To Love You Anymore", and "Is There Love After You". Several of these songs later ended up on Webb solo albums. In 1992, Webb completed a musical called Instant Intimacy, which he developed with the Tennessee Repertory Theatre. The musical contained new songs that he and others would later record, including "What Does a Woman See in a Man", "I Don't Know How to Love You Anymore", and "Is There Love After You". That same year, Webb performed live at the club Cinegrill, performing "What Does a Woman See in a Man" and introducing several additional new songs, including "Sandy Cove" and an old folk hymn, "I Will Arise". 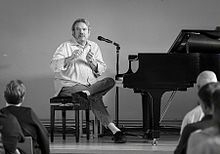 Since 1993, Jimmy Webb has produced five critically acclaimed solo albums: Suspending Disbelief (1993), Ten Easy Pieces (1996), Twilight of the Renegades (2005), Just Across the River (2010), and Still Within the Sound of My Voice (2013). He has continued to expand his creative landscape to include musicals, commercial jingles, and film scores. In 1994, Webb teamed with Nanci Griffith to contribute the song "If These Old Walls Could Speak" to the AIDS benefit album Red Hot + Country produced by the Red Hot Organization. In 1997, Webb co-produced Carly Simon's "Film Noir" album and contributed his vocals, orchestration and piano skills to the project which was filmed for an AMC documentary (which premiered in September 1997). He also co-wrote the song "Film Noir" with Simon. Webb reprised his role as arranger and co-producer on Simon's 2008 album, "This Kind of Love". In 1998, Webb completed his first book, Tunesmith: Inside the Art of Songwriting, which was published by Hyperion Books. It was well received by songwriters and performers and became a best-seller. One book reviewer described it as "a companion every serious songwriter should read, and read again, and keep handy for referral". In the 2000s, Webb has talked more openly about his return to the Christian faith of his upbringing and the role it has played in his music. In addition to his cantata, The Animals' Christmas, he has always included religious songs in his albums—"Psalm One-Five-O", "Jerusalem", and "I Will Arise" are a few examples—and his lyrics have included biblical verses and allusions. In an October 2007 interview with Nigel Bovey, editor of The Salvation Army newspaper The War Cry, Webb was quite explicit about his renewed faith. I couldn't write a song without God. Sure, I could hack out hackneyed phrases and clichés, but to write anything meaningful I have to be in tune with God. He is the great source, my inspiration, the current that I have to connect to. Sadly I've not always used the gift He's given me—the answered prayer—as best as I could or should have. I've made mistakes. I've done things I wish I hadn't done. Webb has stated, "I am a strong believer in God... God is important to me. God is bigger than any one particular denomination. I don't like it when people try to confine Him. I don't put any limits on God." Webb reads the King James Version of the Bible. In 2007, he released a live album of his show, Live and at Large (2007), which was recorded in the United Kingdom. The album included personal stories and anecdotes about Richard Harris, Waylon Jennings, Harry Nilsson, Glen Campbell, Art Garfunkel, Frank Sinatra, and Rosemary Clooney. Webb appears in the 2008 documentary The Wrecking Crew providing thoughtful and descriptive insights into the world of California session musicians in the 1960s. In June 2010, Webb released Just Across the River, an album of newly arranged Webb songs that featured guest appearances by Vince Gill, Billy Joel, Willie Nelson, Lucinda Williams, Jackson Browne, Glen Campbell, Michael McDonald, Mark Knopfler, J. D. Souther, and Linda Ronstadt. In 2011, Webb was unanimously elected Chairman of the Songwriters Hall of Fame, replacing Hal David who retired after ten years in that position. In May 2012, Webb travelled to London to receive the prestigious Ivor Novello Special International Award, which recognizes non-British writers and composers who have made an extraordinary contribution to the global musical landscape. In September 2012, Fantasy Records released Glen Campbell and Jimmy Webb: In Session, a collaborative album by Glen Campbell and Jimmy Webb. The album and its accompanying DVD were filmed, taped, and recorded in December 1988 in the Hamilton, Ontario studios of CHCH-TV as part of the Canadian concert series In Session. Webb continues to perform throughout the United States and abroad. In 2017 he published an autobiography The Cake and the Rain: A Memoir. In 1974, Webb married 18 year-old Patricia 'Patsy' Sullivan, a model-cover girl and youngest child of screen actor Barry Sullivan and Swedish actress and model Gita Hall. The couple met posing for the cover of Teen when she was twelve years old. Sources say their age difference at the time caused a lot of criticism from the press due to Patsy's young age. Walking down the aisle at their wedding was their 19 month-old son who had been born when Patsy was still a minor. After they married, the couple had four more sons and then a daughter together. Two of their sons later formed a rock band, "The Webb Brothers" which later included the couple's third son, James. The Webb Brothers achieved critical success and had a substantial following in Europe and continue to work in the music industry. In 2009, Webb and his sons collaborated on the album Cottonwood Farm. After 22 years of marriage, Sullivan and Webb separated and later divorced. Webb gave up alcohol a few years after their divorce and revived his performing career. In 2004, Webb married Laura Savini, who appeared nationally on PBS in pledge-drive programs. From 1996 to 2011, Savini was Vice President of Marketing and Communications at WLIW, a PBS station in New York City. The couple first met backstage on New Year's Eve 1999 at Billy Joel's 2000 Years: The Millennium Concert at Madison Square Garden. They met again when Savini interviewed Webb for her local television show and the two soon started dating. They settled on the North Shore of Long Island. Savini and Webb have no children. She is involved in promoting Jimmy's career. ^ a b c d Eder, Bruce. "Jimmy Webb Biography". AllMusic. Retrieved December 1, 2013. ^ "Jimmy Webb Writing & Arrangement Credits". Discogs. Retrieved December 1, 2013. ^ a b c d e f g h i j "Jimmy Webb: Biography". Songwriters Hall of Fame. Retrieved January 29, 2015. ^ Heisch, Melvena Thurman. "James Layne Webb". Oklahoma Historical Society. Retrieved December 1, 2013. ^ a b c d e Shane, Ken (April 2006). "Words and Music: Jimmy Webb". Thrive. 1 (12). Community Media. ^ "Oklahoma Music Trail: Jimmy Webb | TravelOK.com - Oklahoma's Official Travel & Tourism Site". www.travelok.com. Retrieved 2019-04-10. ^ "Webb, Jimmy | 1999". oklahomahof.com. Retrieved 2019-04-10. ^ a b c d e f g "Jimmy Webb Biography". Musician's Guide. Retrieved May 17, 2010. ^ a b c d "Jimmy Webb Discography". An Unofficial Jimmy Webb Homepage. Archived from the original on October 29, 2009. Retrieved October 12, 2011. ^ Torn, Luke (2004). "Interview: Jimmy Webb". Uncut. Retrieved January 29, 2015. ^ Ruhlmann, William. "And So: On". AllMusic. Retrieved October 25, 2012. ^ a b Eder, Bruce. "Letters". AllMusic. Retrieved December 1, 2013. ^ a b c Eder, Bruce. "Land's End". AllMusic. Retrieved December 1, 2013. ^ a b c d e Ruhlmann, William. "El Mirage". AllMusic. Retrieved December 1, 2013. ^ a b Ruhlmann, William. "Angel Heart". AllMusic. Retrieved December 1, 2013. ^ Webb, Jimmy. Tunesmith: Inside the Art of Songwriting. Retrieved October 29, 2011. ^ Carlton, Jace (July 2000). "Book Review". The Songwriter's Connection. Retrieved October 29, 2011. ^ a b Bovey, Nigel (October 7, 2007). "I'm a bit like the Prodigal Son" (PDF). The War Cry. The Salvation Army. p. 5. Archived from the original (PDF) on December 7, 2008. Retrieved January 28, 2015. ^ "Chairman's Letter". Songwriters Hall of Fame. Retrieved October 29, 2011. ^ a b "Winners of the 57th Ivor Novello Awards". IVORS. Archived from the original on July 29, 2012. Retrieved October 28, 2012. ^ Leggett, Steve. "In Session". AllMusic. Retrieved October 29, 2012. ^ "Jimmy Webb Performances". The Jimmy Webb Music Company. Archived from the original on October 26, 2012. Retrieved October 29, 2012. ^ Webb, Jimmy (18 April 2017). "The Cake and the Rain: A Memoir". St. Martin's Press. Retrieved 8 December 2017 – via Amazon. ^ Barmash, Jerry. "Longtime WLIW/Channel VP Laura Savini Stepping Down ..." Media Bistro. Retrieved October 29, 2011. ^ "ASCAP Board of Directors". ASCAP. Retrieved January 29, 2015. ^ "Johnny Mercer Award". Songwriters Hall of Fame. Retrieved January 29, 2015. ^ "ASCAP Voice of Music Award". ASCAP. Retrieved January 29, 2015. ^ "2013 Inductees". The Great American Songbook Hall of Fame. Retrieved January 29, 2015. Alden, Grant; Blackstock, Peter, eds. (2009). No Depression #78:Family Style. Austin: University of Texas Press. ISBN 978-0-292-71930-9. Webb, Jimmy (1998). Tunesmith: Inside the Art of Songwriting. New York: Hyperion. ISBN 978-0786861316. This page was last edited on 10 April 2019, at 04:11 (UTC).